Afraid someone over your shoulder just figured out your four-digit passcode on your brand new iPhone 5? This won't matter if Apple makes use of its recently approved fingerprint patent. The U.S. Patent and Trademark Office just granted Apple a two-step unlock screen patent that incorporates a fingerprint reader into the bottom right corner of an iOS device. Illustrations shows a familiar slide-to-unlock screen on an iPhone, followed by a new prompt that asks the owner to place his or her thumb on top of a window situated next to the home button. 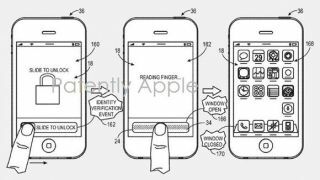 Interestingly, PatentlyApple suggests that the new security window may blend into the iPhone, as it changes "between opaque and transparent configurations using a polymer dispersed liquid crystal (PDLC) window." Apple's symmetrical iPhone design would remain intact. There's more to this security-focused patent than the fingerprint homepage unlock screen. Smiling from ear-to-ear is illustrated as an alternate method of getting beyond the homepage unlock screen. Additionally, eye recognition acts as another owner-only way of accessing the device. Beyond getting past the homescreen, the illustrations detail the ability to sign-off on e-Commerce purchases. The drawing doesn't specify whether these secure transactions can be performed online, offline, or both. This scifi-like method of verifying one's identity is in line with Apple's recent purchases of two security firms. Apple bought AuthenTec for $356 million this summer, and the Florida-based company has a history of making fingerprint scanning technology for mobile devices. The patent is given further weight with Apple's recent interest in biosecurity firm Microlatch. The two companies are said to be working together in an effort to shore up technology for NFC in future iOS devices. Given Google Wallet's year-long experience with NFC and the fact that Microsoft Wallet has been shown off already, Apple may already have fast-tracked this idea from patent to production for the next iPhone.